Angie Blumberg and Jayce Conway tied the knot on July 28 with an outdoor ceremony in gorgeous Big Sky, Montana. 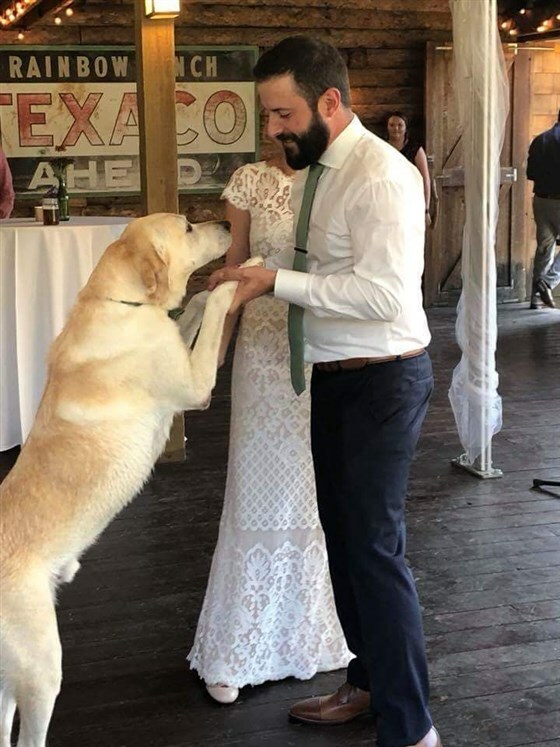 The couple knew from the start they would include their beloved Yellow Lab, Boone in their big day, but they had no idea the happy-go-lucky pooch would end up stealing the spotlight! Boone’s job was to serve as best man, standing between Conway and his brother during the ceremony. At first, he sat obediently by his dad’s side as the wedding party made their way down the aisle. However, seeing the lovely bride was too much for him to handle. The 6-year-old sweetie made a beeline to Blumberg – wishing her some last minute luck, I’m sure! But his visit with the bride was just the beginning of Boone’s wedding day antics. 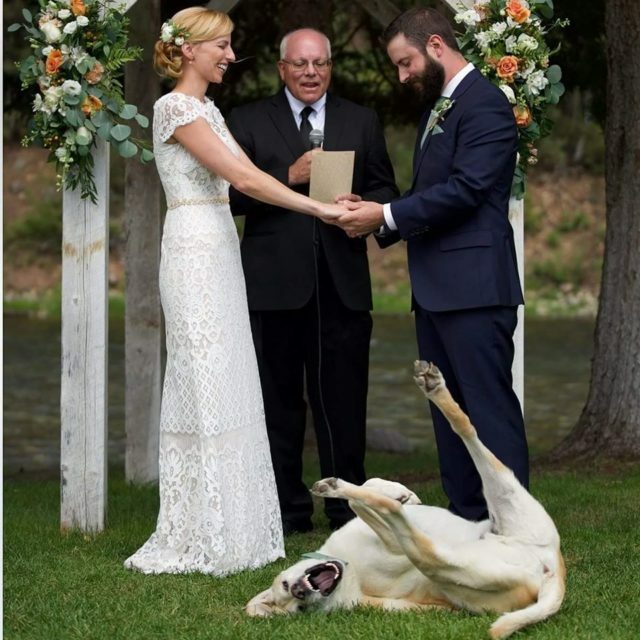 As the officiant began the opening prayer, he plopped down in the cool grass directly in front of the happy couple and began to roll about, kicking his paws up and making silly faces! As you can see from their faces in this fabulous photo — snapped by photographer, Chris Davis — Blumberg and Conway took the incident in stride. It was a fun, light-hearted moment that made their ceremony all the more special. While the couple was away on their honeymoon in Utah’s Zion National Park, the photo was posted to social media where it immediately went viral. Without cellphone service, Blumberg and Conway had no idea their pooch had become overnight-famous until they returned from their trip. The new little family is excited to embark on the next phase of their lives together… I wonder which special events we can look forward to Boone photobombing in the future? ?